There is SO much to say about this year’s CSA season. I will try to be brief and stick to the important stuff. Please note that we rely heavily on our blog to convey information to our members. Check it weekly to stay informed and to check out the great recipes! You will note that this year while all of our deliveries are on Wednesdays (except for Indiana and Oakdale) we still have two routes: Asparagus and Zucchini. Now this doesn’t mean that members on the Asparagus route are going to get all the asparagus that western PA has to offer and that Zucchini will correspondingly, get none. The route names are just that. They are names. We will use them to indicate to our members what items will be in their CSA on any particular week. You will see this application in our Harvest List below. We will do our very best to be sure that each route gets its fair share of everything. If your ordered a tote bag when you signed up for your share it will be at your pick up location on April 11th. Please look for one with your name on the tag. We suggest washing these bags in cold and not drying them they as they are cotton and may shrink a bit. Vegan and gluten free shares will be marked as such. Please do not take a VEGAN or GLUTEN FREE share unless you have signed up for one. The pick up sheet will indicate what type of share you are signed up for. Let us know if any changes need to be made. 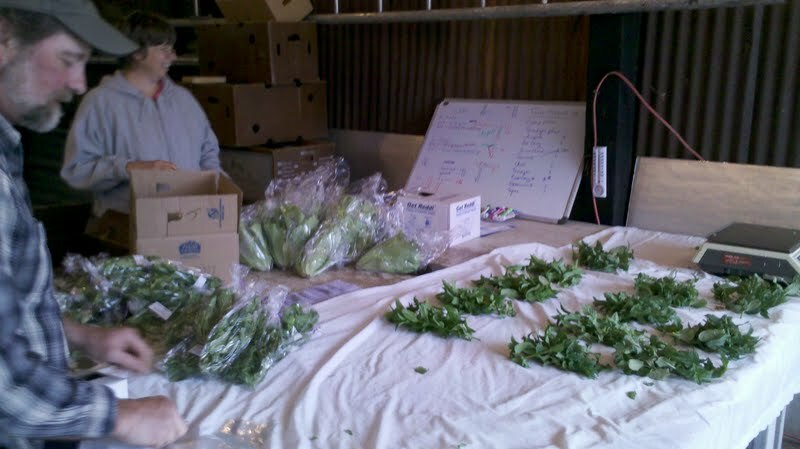 The watercress that was supposed to be included in the Asparagus route’s boxes sadly will not be (as indicated below). It serves as a great reminder that while all of our growers work their hardest and have the best of intentions, sometimes things just don’t unfold the way we would like them to. If we ever have to pull an item from a box we will be certain to make up that value in a future share. The Penn’s Corner Farmers and Staff welcome you to the 2012 CSA season! We love hearing your feedback and are always available to answer questions or be of assistance. Big Oven has a Glazed Turnips with Chives recipe that looks interesting although we haven’t tried it yet! This is an easy recipe to toss in the oven to bake while you prepare the rest of your meal. Depending on the other flavors in the meal, consider layering in a handful of chopped fresh herbs to the dish. Saute onions in a small amount of oil until lightly browned. Add butter and vegetables and cook for about 5 minutes. In a small casserole dish, make layers of veggie mixture, drizzling each layer with cream and sprinkling with a bit of salt and pepper. Top with bread crumbs and cheese, cover with foil, and bake in a 375 degree oven for about 40 minutes, until cooked through. Remove foil and cook about 10 more minutes until top is golden brown. We were planning to include watercress in the Asparagus boxes this week but we were foiled. After being harvested and packed and placed in a cooler the cress very quickly began to turn yellow. No cress for us this week! * we posted this recipe for our Winter Share members. It is DELICIOUS!!! 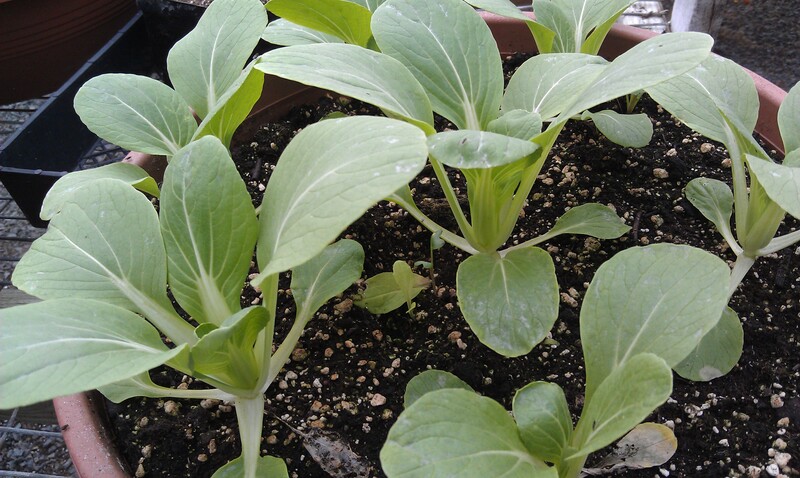 Split baby bok choy in half. Clean thoroughly under running water or soak in a bowl of cold water. Melt butter in large skillet. Add oil and pepper flakes (if using). Stir in stock, syrup and soy sauce. Taste and adjust to taste as needed. Place bok choy cut side down in pan and cover. Cook for 3 – 4 minutes. Turn over bok choy, cover again, and cook an additional 3 – 4 minutes. Cook until desired tenderness is reached. Most of us don’t love just snacking on storage apples. While they have their many honored and practical uses, they can lack a little appeal for snacking. Here are a number of suggested recipes for your Rome apples. See which suits you best. 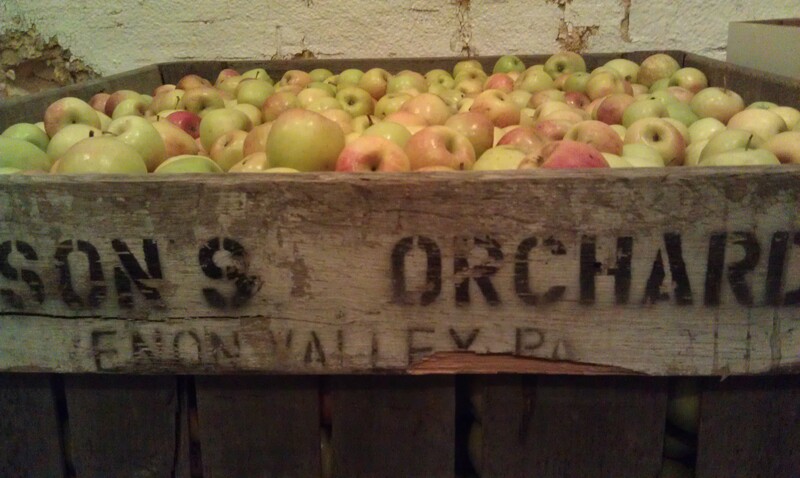 And let us know what you chose to do with your apples! Simply Recipes offers up Apple Walnut Gorgonzola Turnovers Recipe and Apple Chicken Quesadillas. If you aren’t familiar with ramps be sure to do some reading up about them. In short, a ramp is is an early spring vegetable, a perennial wild onion with a strong garlic-like odor and a pronounced onion flavor. Ramps are found across North America, from the U.S. state of South Carolina to Canada. They are popular in the cuisines of the rural upland South and in the Canadian province of Quebec. 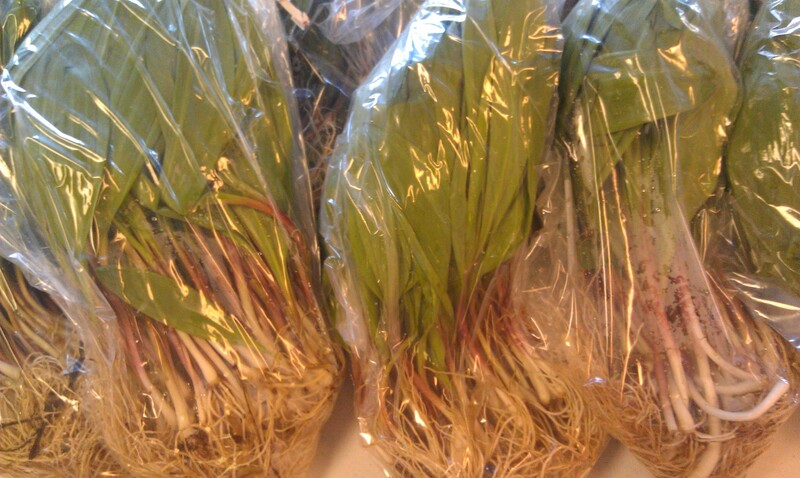 Ramps also have a growing popularity in upscale restaurants throughout North America. Try this tasty ramp pesto recipe or grill them and throw them on a pizza! Our great friends at Small Farm Central are looking to fill a Customer Support position. We thought that our foodie, often tech-savvy members might be interested. Click here to take a peek at the posting! Ever have more vegetables or fruit than you can eat? Are you interested in the learning how to preserve food safely? Penn State Extension-Allegheny County is now offering a series of food preservation classes, using up-to-date research-based information. Each class will be composed of formal instruction, an actual preserving demonstration, samples, and recipes. Your instructor will be Penn State – Master Food Preserver, Susan Marquesen. Please note: all classes will meet from 6:30 to 8:30 p.m. Registration is $20 per class, or $85 for all 5 sessions. Hot Dang! I made the recipe for the bac choi and the turnips, and while the turnips didn’t come out “glazed” they did turn out awesome. Ramps and potatoes are gonna be on a pizza tomorrow and the apples are awaiting a crisp, and the mint is going into tea. So excited for the season! Some of the potatoes went into a simple potato salad (potatoes, horseradish mustard, mayo, salt, pepper, nutmeg) — transformed by the addition of those super-fresh chives. Some went into potato pancakes (mashed potatoes, beaten egg, flour, bread crumbs), which I ate with some homemade applesauce (always so much better than the store-bought kind). To make the applesauce, I peeled, cored and sliced 8 apples (about half the bag) and tossed them in a mixture of melted butter, lemon juice, brown sugar, apple juice and pumpkin pie spice (cinnamon, ginger, nutmeg, allspice), then roasted in a 350 degree oven for about an hour (until nice and soft) and mashed. OMG, I should have done the whole bag! Bok choi brightened up some minestrone soup, served alongside the bread and cheese you sent. Still haven’t done anything with the turnips yet. The only failure (which was entirely my own) was the ramps — I tried to make a ramp pesto, but I over-salted it, entirely obscuring the flavor. I’m really hoping I get a second chance with ramps this week… Thanks, Penn’s Corner, for giving our kitchen a much-needed springtime kick in the pants!